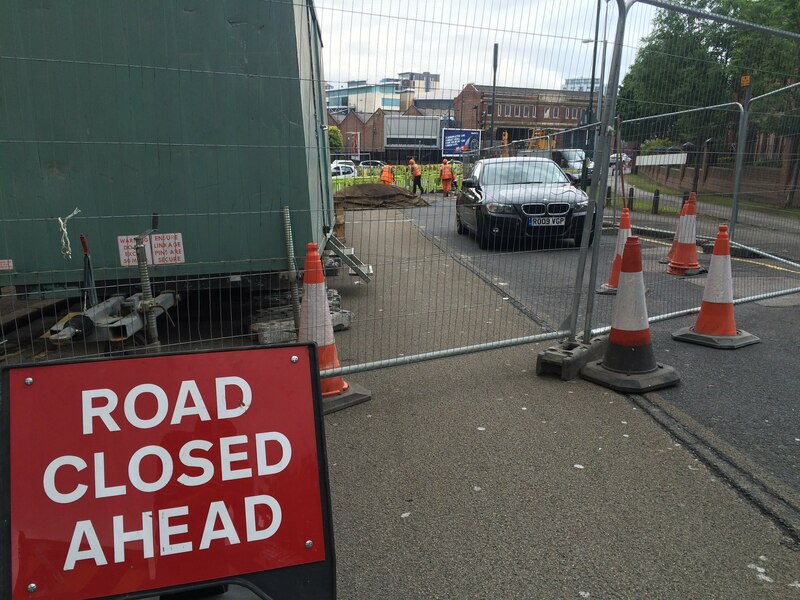 Sneinton road works update: Manvers/Pennyfoot St. Dangerous junction is finally being upgraded for pedestrians. Roadworks will be in place until 20th September. Above: Motorists may face 3 month delays. Bus routes are being diverted and pedestrians have already reported additional problems in crossing. But the changes are badly needed! Just weeks after the completion of the infamously slow paced work around Sneinton Market, roadworks have started on the Manvers Street/Pennyfoot Street junction. This is a critical junction for motorists, cyclists and pedestrians from a large part of Sneinton wishing to connected to the Lace Market, City Centre and rail station areas. However, for cyclists and pedestrians the junction has long been a notoriously hair-raising experience to cross... there have been NO pedestrian crossing facilities at all. Now at last pedestrian crossing signals are being installed. There will be the inconvenience of 3 months disruption, but let's hope (this time) that the new design is a noticeable improvement. Surely it could not be worse than what we've had until now? For more information please download the roadworks information leaflet.